It is official. I have graduated from high school!!! 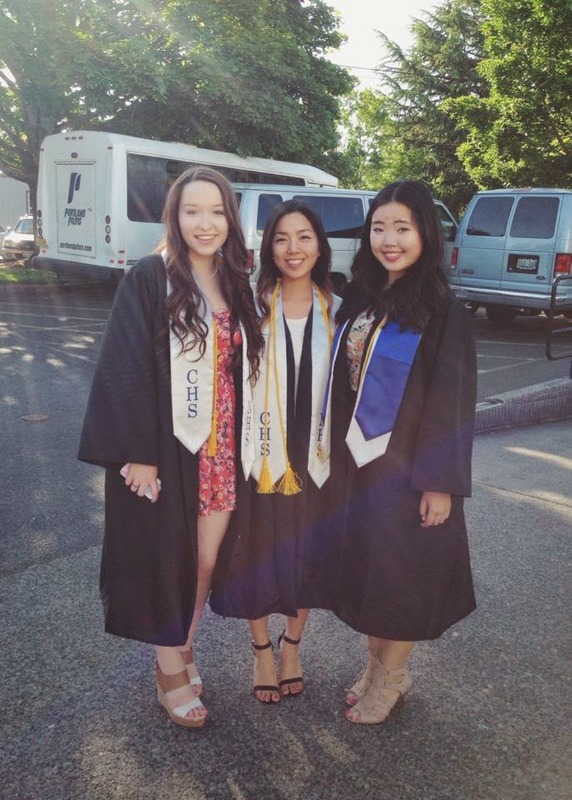 In this post, I want to talk about all the great and wonderful life lessons (ha yeah right) that I learned from good ol' high school, and not just graduation, since there really isn't a whole lot to talk about. 1. Following the crowd just means you're not leading yourself. I know this is something that is said a lot, but it is very true: always be yourself. It's no fun trying to be someone you're not in order to fit in with everyone else. Not having the latest and greatest technology, not liking the newest pop songs, not having brand name clothes that still smell like the factory they were made in, or not being caught up on the latest trends is fine. You should be more concerned with who you are, and what you truly like instead. Like country music, vintage collectables, and have clothes that aren't designer? Great! Just as long as you are being true to who you are, carry on living your life the way you want to. 2. Being a "cool" kid is not the most important thing in life, and won't even matter after high school. I don't know about other schools, but the "popular" kids at my high school were the party-ers who went out every weekend, drank, and did drugs. I wish I was over-exaggerating, but I'm not. Most of them were extremely rude and hated everyone (including their "best friends") and believed that everyone loved them. In reality, they were not well liked (surprise, surprise) and had very few true friends. So, again, be the person you want to be, and find friends who truly care about you. 3. People will change, for better or worse. It is inevitable that change will happen in high school, both physically and mentally. Some of these changes are good, and in other cases, bad. Sometimes, changes aren't really good or bad - they can just mean that you are going down a different path then someone else, which is sad, but does happen. It doesn't necessarily mean that one person is better than the other, it just means that you are becoming different people who don't really fit into each other's lives anymore. 4. Having a solid group of friends is very important. It's really nice to have a group of people whom you can depend on if anything ever happens. If you have an awful day you can vent to them about it, or if you aren't feeling safe, you have people to go to in order to solve the problem. I've always been very close with my family in addition to having a great group of friends, so it's nice being able to get advice from them, but I know that not everyone is fortunate enough to have a close relationship with theirs, so a group of close friends is even more important. 5. Your parents do actually know what they're talking about sometimes. I know sometimes it's hard to believe, but this is, in fact, true, and sometimes they can relate to your problems. They, too, went through high school so they have had much of the same experience as you. I always go to my parents for advice since they've lived much longer than me and have a lot of wise words to offer, and it usually helps me figure out tough situations. Sometimes the advice your friends give isn't as good, because they're basing it off of hypothetical experience - they haven't always gone through the situation you are asking advice about. Because of this, advice from your parents can be particularly helpful. But don't get me wrong, advice from your friends can be great as well. 6. Find something that you love to do. With the stress of school, friends, and just life in general, it really helps to find something that you love to do in order to relax - whether it's a sport (I was on the swim team all throughout high school), art, writing (I also did a lot of this), reading (huge fan of this)...there's plenty of options. I found that having something you love that you can throw yourself into helps keep you sane so you aren't drowning in stress. It also helps you to find other people who are interested in the same thing, and enables you to connect with them. 7. Having an incredible love life is not the most important thing in the world. I know, I know, at this age it can be hard not to want love and an incredible relationship, but do not make it your only goal. I knew people like this in high school and they often ended up miserable because they're whole life was centered around finding a significant other. Do not, I repeat, do not think that your happiness is centered around finding someone to be in a relationship with, or finding someone to fall madly in love with and have some epic love story. You are the only person who can make yourself happy! Don't let your happiness depend on someone else because you will not end up very happy, or it will take a long time to get there. As cheesy as it sounds, allow yourself some time to get to know yourself and realize who you are, separate from other people. 8. Not everyone is going to like you, and you're not going to like everyone. This is completely okay, and a natural fact of life. It would be impossible to get along with every single person you encounter, and to like all of them. Sometimes you meet people who you simply do not like; when you do come across these people just nod your head and walk away. I'm not a confrontational person (I loath confrontation and try to avoid it at all costs), so I have found that it is easier just to focus on the people who you do get along with, and just spend time with them. However, sometimes it is hard to avoid people you don't like, so you have to find someway to coexist with them. This has happened with me, and I'm sure most everyone has been in this situation, and when this does happen just try your best to act "professional" and, if possible, try to avoid talking to them. If you have to, just think of them as any other person, and disregard your feelings toward them and try to work together. It is easier said then done, but in the end it will all work out. 9. Try to be the bigger person in arguments, and simply walk away. This can be really hard in some cases, but it is, a lot of the time, the best option. When dealing with a bully or someone you simply have conflict with, just realize that you don't want to lower yourself to their level and say things that you wouldn't if you were calm. This is a great trait to have for your whole life, so why not start in high school. 10. The saying "what Suzie says about Sally says more about Suzie then it does Sally" is very true. I really hate drama, and having it in my life, so I tried to avoid the whole gossip and rumor mill in high school. It makes life a lot easier, and you find better friends this way. I knew a lot of girls that were "best friends" but would then go and talk about each other like crazy behind each other's backs. This said a lot about what kind of person each girl was (and still is), because it showed just how petty and rude they are. So, once you make friends, it's usually best not to talk about them behind their backs, or anyone for that matter. It doesn't matter if you know them well or not, it is always a horrible thing to start rumors about other people. 11. Be comfortable in your own skin, love yourself, and be true to who you are, no matter what anyone says. Bullies are cowards and are more often than not, very insecure about themselves. Don't let anyone make you feel less about yourself, because the only opinion that needs to matter to you, is yours. My dad has always told me this, which has really helped me to not care (as much) what other people think. Yes, it is very hard sometimes not to care about what other people think, but always try to stay true to yourself and what you like. You shouldn't ever have to change for other people; the people who truly care for you won't care who you are, because they'll love you just the same. And never be afraid to be yourself! Fitting in is over-rated, and the most interesting people are never clones of other people. Remember that there is only one you, so be the best you possible, and be proud no matter your ethnicity, sexual orientation, financial situation, and all sorts of other factors: BE YOU. Thanks! And yeah I have really changed a lot since the beginning of high school, but I can't wait for college! Excellent post! While high school may have not been my favorite, it did teach me a lot! You will love college; I am having the absolute best time! Congrats! Thank you! :) Yeah high school wasn't my favorite, so I'm hoping college will be fun! This is such a cute post! Funnily enough I actually did a very similar post on my blog a few days ago. It's a little different though since I'm English so it's what I learnt from Secondary School rather than High School. Thanks! :) Ooo I'll have to check it out! Haha yeah I forget that high school is different in England! This is really lovely, it's something I wish i'd read a long time ago! Yeah I definitely went through that stage throughout middle school and early high school! I think everyone did especially at that age...haha it's good to know now though that those people most likely won't do a whole lot with their lives because they weren't even focused on school! Love your blog so so much! These are some seriously great points. I especially agree with #4! I think it's so helpful to have a group of friends to turn to during stressful times or to share happiness when something exciting happens. Thanks! :) Haha I know right, I'm so glad it's summer! Yeah it is super helpful! It's so nice knowing you always have people to fall back on.